Personal trainer David Last has seen clients invest in GPS watches and food-tracking apps without first mastering the basics. Fitness technology has become increasingly popular in recent times. OUR OBSESSION WITH personal technology and constantly being switched on has filtered into the health and fitness industry in recent times, from GPS watches to step-counting apps. For some of us, the advance of technology has helped us in our fitness goals as different resources allow us to track and monitor our progress, while for some it can be an unwelcome distraction. It is something I am always asked when working with new clients, so in this week’s column, I’m going to investigate whether it’s really necessary to invest in a fitness watch or similar gadgets — and, if so, what are the benefits? A quote I use regularly is ‘if you are not assessing then you are really only guessing’ and tracking devices and apps can certainly help in this regard, while others can be a complete waste of time and money. The recommended number of steps we should all be hitting on a daily basis is 10,000 and this is one of the basics to work on before you start to narrow your focus with training devices. For the Monday to Friday busy office worker this number might seem like a challenge but by using your smartphone’s health app, you can monitor your progress become more conscious of your daily average and whether you need to make a concerted effort to improve your activity levels. And the best part is you don’t have to slash out on the latest fitness watch to do so, as there are a number of free apps available to do the job. Having said that, remember the goal is just to move a little more and enjoy getting outside, rather than spending most of your day with your head stuck in your phone monitoring how many steps you’re taking. Switch off, get outside and clear the head. The rapid change in technology, in just one sector like the fitness industry, is incredible as new and improved versions of gadgets and devices are released at regular intervals. If you’re in the market for a fitness watch, the choice is now endless between different brands, specs and colours and many people can get bogged down by what looks the best rather than finding a device to suit your needs. My advice here is to commit to yourself first and prove that you can be a little more active on your own accord first before going down the route of making a big purchase and once you have stuck with it and want to get a little more specific, then perhaps make the investment. Rather than your phone telling you to take 10,000 steps, watches like the Garmin Insights feature will nudge you if it senses you’re moving less than you usually do on a given day of the week. Fitbit watches allows users to set and track personalised goals related to things like weight and cardiovascular fitness. Overall, a fitness watch is great for logging and keeping track of your training and recovery data. It can pick up holes in your training like disturbed sleep to even positives in your training like an improved running time. Whether you’re training for a specific race or just looking to be more active in general, a fitness watch can help you closely monitor your activity and training. My top brands to consider are Garmin and Polar or Fitbit. Monitoring your heart-rate has always been important for athletes but only in recent years has it become normal for amateur athletes to do the same. With the influx of new technology, it really is quite easy to monitor your heart-rate during a session using your watch or device. One of my favourites is the Polar heart-rate strap that connects up to your watch and most cardiovascular equipment. For a lot of us, it seems that the higher we can get the heart-rate the better the workout. Yes, in the odd workout this can be useful but in my opinion, the smarter approach is actually trying to find the right heart zone you need to stay in and monitoring that. For a lot of my weight loss clients, we use a simple heart-rate monitor to actually control their intensity giving them the right stimulus they need for that particular day –remember the higher the intensity is not always the right answer. It can be a little tricky to understand what zone you need to be targeting for your particular goal so my best tip is to seek some advice from a trainer who knows what is the best approach for you. 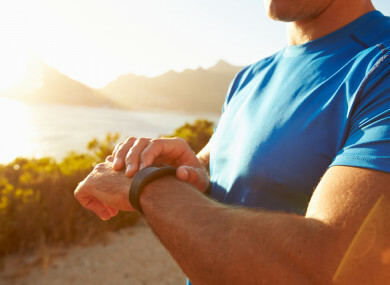 It’s not just your activity and workouts that can be logged and monitored. There are endless options nowadays to keep tabs on your nutrition and this is incredibly important if you are to hit your goals. At the end of the day, calories matter and the right amount of macro-nutrients should be monitored to get a guideline of what you’re putting into your body. A common mistake I see with clients is them playing the guessing game with food and often that leads to no progress or disappointment at the end of their programme. The best advice for total beginners is to hone in on the basics first and get them right before starting to look a little further into apps to monitor your nutrition requirements. Simply, drink enough water, quit the junk food and have a balanced 80/20 realistic approach with your nutritional lifestyle. Once you have nailed the basics, then you might find an app like MyFitnessPal more useful. Email “The fascination with fitness technology and whether it helps us hit our goals ”. Feedback on “The fascination with fitness technology and whether it helps us hit our goals ”.